The iconic building at the corner of Main and Walden streets once housed The Toy Shop and Snow’s Pharmacy. It’s one of several prominent Concord Center storefronts that are vacant. Shoppers strolling the well-maintained sidewalks of Concord Center always find plenty to look at as they pass by the inviting shops: jewelry, fine art, stationery, gourmet food, sporting goods, books by authors both local and international. For one of New England’s most walkable villages — and beloved tourist destinations — even the relatively small number of vacancies seems to loom large. Is there more to Concord’s changing retail climate than the groundswell of online shopping that plagues shopping districts, malls, and stores nationwide? Not to worry, says John Boynton IV, a local investor and lifelong resident of the town. Owner of several commercial properties in downtown Concord and the neighboring village of West Concord, Boynton sees the string of vacancies in Concord Center as more a coincidence than a trend. “One reflects a shop owner who retired; one is a building that was recently sold and is undergoing renovations by its new owner; and one was a business that just didn’t thrive in this location,” he reels off. And besides, says Boynton, when one business closes, another opens. For example, in his property on Walden Street, the restaurant Bondir has departed but a restaurant called Fiorella’s will soon open in the same space. Sharon Spaulding, manager of Spaulding Management LLC, concurs. Among the properties she owns in Concord Center, there’s just one vacancy, and she has a new tenant signed to be open for business by mid-October. Things are also looking up for the beloved two-story brick building that stands empty at the west corner of Main and Walden. Shoppers in decades past remember when it was anchored by the old-fashioned Snow’s Pharmacy. Then it was reinvented as The Toy Shop, where the front door was painted red and white columns were wrapped with garlands at Christmastime. Two years ago, The Toy Shop moved to a different location in town, and its former home was shuttered. However, Burlington-based Linear Retail, which purchased the building a year ago, has just announced its first signed tenant: The London-based Caffe Nero will open in the street-level space in early 2018. Joel Kadis, a partner at Linear, said that as soon as he and his colleagues set eyes on the property, they knew it belonged in their portfolio. Other Linear holdings that reflect this priority include buildings in Newton Centre, Lexington Center, and Wellesley. 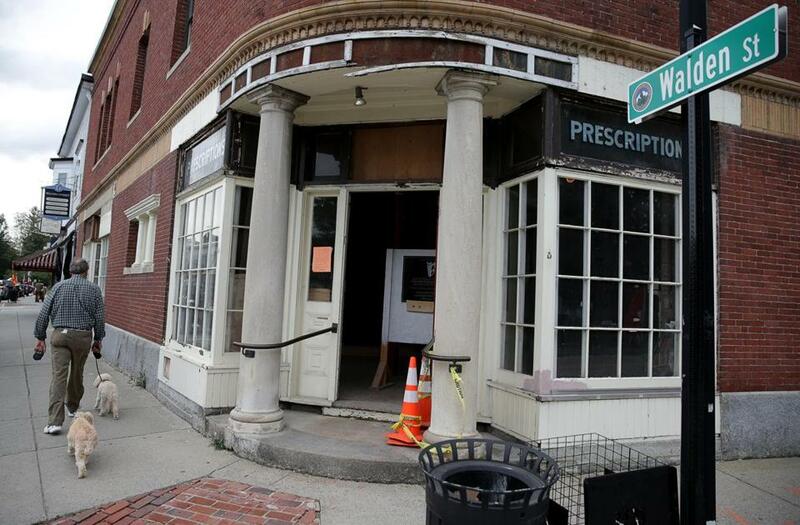 Kadis said that even though his company has poured nearly $2 million into renovations to bring the antique building up to code, he has no qualms about the Concord retail climate. Caffe Nero will occupy half of the street-level space in the building, according to Kadis, and businesses including an architectural firm and graphic design firm have already signed on to second-floor office space. What kind of business claims the other half of the street level remains to be seen. But in a town dominated by local property owners, the purchase of a landmark building by a larger outside investment company may portend the possibility of future problems for Concord retailers, according to Boynton. Two miles down Main Street in West Concord Village, it’s a different story. 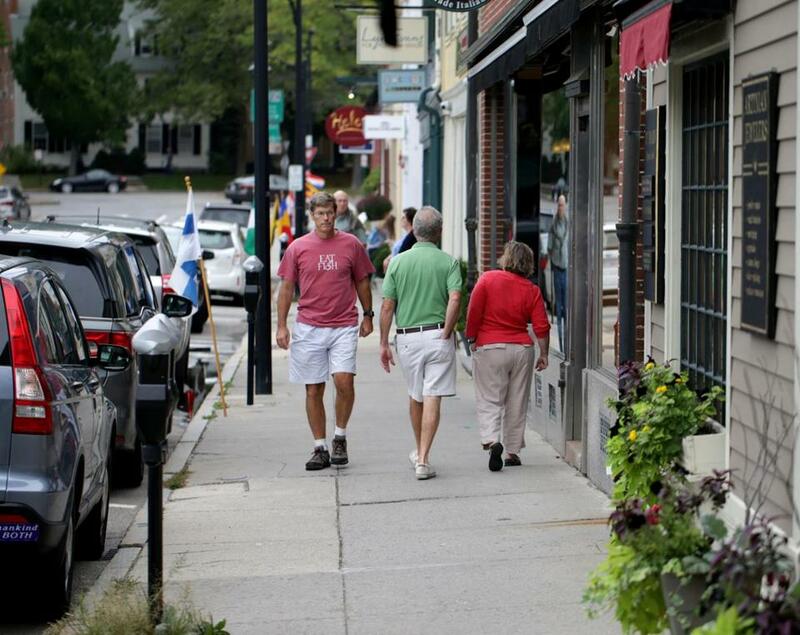 With almost no empty retail space in evidence, West Concord’s main strip, Commonwealth Avenue, welcomes a busy stream of locals and businesspeople whose loyalties and interests may be different from the day-trippers and tourists more common in Concord Center. Mary Bilodeau-Klinoff has years of experience with retail in both business districts. For over 30 years she co-owned The Grasshopper Shop in Concord Center with her sister; a few years ago she left to start her own business, Concord Firefly, in West Concord. Bilodeau-Klinoff pointed out that there’s a trade-off: West Concord doesn’t enjoy the tourism traffic that Concord Center does, but rents are lower as a result. She pays $1,100 a month for her storefront in West Concord; when she left Concord Center, her rent there was more than five times as much. Peter Lovis has owned the 50-year-old Concord Cheese Shop in Concord Center for the past 14 years and has seen firsthand the value of tailoring a business’s marketing style to a wide variety of customers. Not only is his shop known for its magnificent array of cheeses, wines and other gourmet fare; he also regularly offers events that make retail a more interactive experience, such as his yearly Cheese Parade and his current series of evening seminars introducing customers to different ways of serving food and wine. As executive director of Concord’s Chamber of Commerce, Jane Obbagy has no reason to believe a few empty storefronts will affect the busy fall tourist season, when visitors from all over the world flock to the region’s historical sites, visit Boston-area schools, and take in the foliage. Boynton concurs, but says it won’t happen without concentrated effort and a proactive approach. For one of New England’s most walkable villages — and beloved tourist destinations — even the relatively small number of vacancies seems to loom large.